The Vancouver Sun this morning picks up the federal advisory panel’s report on the economic cost of inaction on climate change and puts a local spin on it. Of course, this is a topic that this blog has been banging on about for a long time. I have long been convinced that “dikes were not designed with climate change in mind, so additional risk from climate change remains a concern.” Of course, whenever I said that in public that was instantly dismissed by people like Richmond Mayor Malcolm Brodie – or one of the BC Liberal MLAs, who all sing from the same song sheet. Both federal and provincial governments pretend to be concerned – but not very convincingly since everything they do points in the other direction. I think it is very telling that the Sun chooses a picture of the Richmond dyke on the Middle Arm – since that is one of the few that has actually seen some enhancement, as a result of federal and provincial spending on the Olympics. A short section of raised dyke does nothing of course, any more than the Maginot Line defended France from invasion. The flood waters will simply slop around the raised section. The annual cost of flood damage to dwellings in British Columbia by the 2050s is estimated to be between $2.2 billion at the baseline level to $7.6 billion under the “high climate change” scenario. That translates into an annual per capita cost of $565-$2,146 in B.C., relative to per capita costs of $108 to $364 nationally. More than 80 per cent of Canadian homes at risk of flooding under the report’s most dire climate change scenario are in Metro Vancouver. Canada can expect to pay between $21 billion and $43 billion each year by 2050 if it fails to come up with a domestic plan within a global agreement to tackle climate change, the report warns. 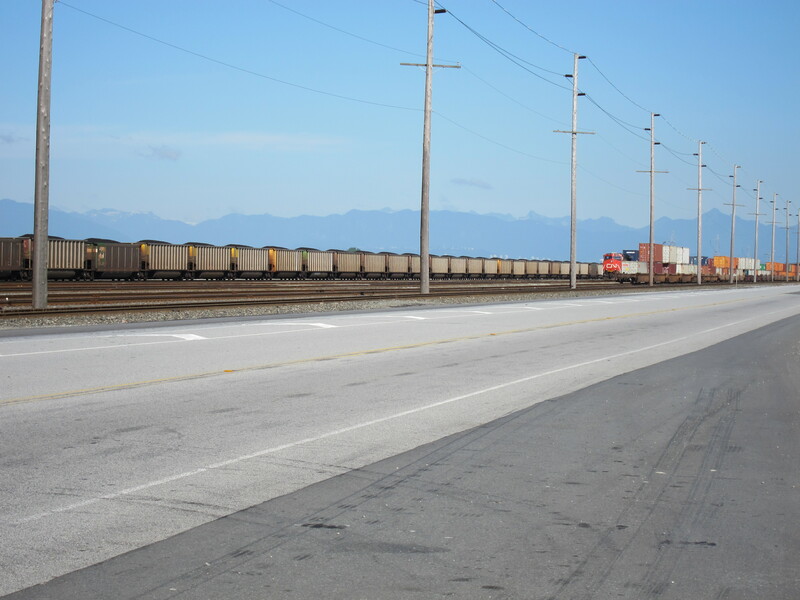 Roberts Bank Coal Port, just outside of Vancouver BC, is North America’s single largest exporter of global warming pollution. It has rapidly carved out a role in the booming export of US thermal coal to Asia. If there was a carbon-offshoring Olympics today, it would win the gold medal. Oddly enough, the general public hardly knows it’s there. We think that needs to change. We’re negotiating a deal to post two billboards at the ferry terminal between Vancouver and Victoria in BC. For one month, people waiting for the ferry would see these two images in rotation, with Roberts Bank just to the north. We hope this will get some people turning their heads and thinking about our future and the role that BC plays in fueling the climate crisis. This blog has carried a 350 badge for a while now. Bill McKibben has sent out the video above of the past weekend of Moving Planet events — a truly amazing show of global solidarity, committment, and creativity. He wrote “This video deserves to be spread far and wide” so I am doing that now. The debate on Translink funding continues to occupy the media. Today’s contribution from Jeff Nagel starts with the intriguing possibility that Kevin Falcon’s “reform” might be rolled back. Of course that won’t happen any time soon, or as a precondition for the Mayor’s signing on for a property tax increase. And, of course, it still has to win cabinet approval, and Falcon is now Minister of Finance who is bound to take a keen interest in issue like gas tax increases and so on. Lekstrom might even think it is a Good Idea – but he is not saying that and couldn’t possibly comment if he did or not. There is also some good stuff from some of the Mayors. Richmond Mayor Malcolm Brodie is one of several others in the region who won’t back the plan because he opposes any property tax hike and won’t take the risk of getting stuck with one. He also wants to know exactly what new source is proposed before he votes on it. Brodie added he would support a two-cent gas tax alone to build the Evergreen Line immediately while work continues to flesh out other funding options. I am not sure that option is actually on the table. It is also means that every other pet project has to wait – and, by the way, the Evergreen Line will have some impact on operations and maintenance spending and there’s not a lot of room for that. But it is rare that I find myself in agreement with Malcolm Brodie, and seems to point in the probable direction of an interim settlement that sees the Evergreen Line started and everything else stay the same until the funding and governance can be worked out. Diane Watts on the current professional board/ Mayor’s council arrangement “Very early on we realized there are pieces of this that just don’t work,” looks like she is increasing the distance between herself and the BC Liberals. Meanwhile the other, related, big story is the prospect of a 12% fare increase in 2013. This comes from Martin Crilly, the Translink Commissioner. Which is – as usual – not saying very much at all. I doubt very much the assertion that a 10% increase in revenue will result from a 12% fare increase. For one thing, we have not had fare increases this far ahead of inflation for a while. For another, there will be a lot of new road capacity coming on stream as the new Port Mann and widened Highway #1 will be completed around then. There will be a few months when that new capacity will look under-utilized. Without some form of tax deal Translink will be even harder pressed to cope with demand which has been rising faster than expected. While people might swallow a big fare increase if there is plenty of good service, when people are already stretched by tough economic times (we have heard the word recession a lot more often recently) they get more sensitive to fare changes. And paying more for a more overcrowded system will look like a very bad deal indeed to those who have a choice. If there is going to be a change in governance the office of the Commissioner seems to me to be one for he things that could easily be chopped. The idea was a sop to those who protested the lack of accountability in Falcon’s new arrangements. If the Mayors start to play a more significant role, why do we need a Commissioner? Actually why do we need him now, come to that. It’s not as if he has any real power. If he can’t say a flat “No” then he’s not much more than a rubber stamp. Nothing personal against Martin Crilly – but he has been pretty useless at protecting BC Ferries users too. Not his fault – it’s the job description – but he did sign on for a thankless, and largely pointless, role. The last few days have seen a great deal of media interest in the upcoming decisionthat the Mayor’s have to make on ways to raise more money for Translink. This has been sparked by press releases from the new Sustainable Transportation Coalition – whose spokespersons are Peter Ladner and (somewhat to my surprise) Gordon Price. They both used to be NPA Vancouver Councillors. Neither of them are particularly ideological but both are firmly on the “progressive”side of the transportation debate. The Sustainable Transportation Coalition is a non-partisan alliance dedicated to building support for long-term transportation funding solutions to create a more livable and economically vibrant region. Coalition members include BC & the Yukon – Architecture Canada, Better Environmentally Sound Transportation, Modo The Car Co-op, the South Coast Chapter – Planning Institute of BC, South Fraser OnTrax, Third Wave Cycling Group and Voters Taking Action on Climate Change. That’s from the release that came into my inbox today. If I may summarize, their main pitch seems to be to push the urgency of doing a deal with the province that would see both a 2c increase in gas tax and a significant rise in property taxes – the latter being something most of the Mayors have been strongly resisting. In fact, the Mayors of this region have been doing that for at least the last twenty years – probably longer. The province has always taken the view that there is room for a property tax increase to pay for transit. The Mayors have always said that there is not only no local tax headroom but that property tax is not a reasonable way to pay for transportation. They would, on the whole prefer that somebody else pay. They point out how much of the total tax bill senior governments take, and they want some of that back. The Coalition seems to agree in principle but says that right now the province can’t come up with any other source of tax, but is at least willing to look at them. And that if there is an increase now it will be rolled back when the new, more appropriate source is determined. The important thing is to get on with building the Evergreen Line and a list of other worthy causes (“Rapid Bus connecting Langley, Surrey and Burnaby; improved bus service around the region; and funding for roads and cycling”). Some of the Mayor’s fear voter backlash such as was seen with Translink’s first attempt to get a vehicle levy. Others simply do not trust the current provincial government. They feel the assurance that the property tax increase will be rolled back is not likely to be delivered on, and I must say I think they are right. The province has been consistent – and has had plenty of opportunity to look at sensible ways to tax or price our transportation system but has always declined to move significantly away from current sources – especially property tax which (it being levied by municipalities) is always its preferred option. Indeed that has been the provincial position though governments of both the left and right. The projects are indeed highly desirable – and have been for a long time. But the Province espoused the crazy Gateway strategy instead i.e. road expansion. And they are now too far gone to roll that back. So anything we now spend on more sensible options will be much less successful since there is going to be a great deal more space for traffic to expand into. Under such circumstances, the probability that we will be able to move the most important indicator – the share of travel in non-SOV modes – is much lower. The province has also stuck to its “revenue neutral” position on the carbon tax, and has refused to even consider car insurance by distance. And the current Premier is not exactly convincing on this brief – she flip flopped on the 2c gas tax – and seems to change her mind on things like election dates (which is after all in legislation her party pushed through) far too readily. Basically, in the negotiating positions, it is always the municipal side that has to compromise. The province has hardly budged at all. The technical issues actually have very little to do with what is going on. It is simply a power play – and the province has most of the power, and is not afraid to use it. Indeed, one of the risks the Mayor’s run is what little say they now have in Translink will be also taken away unless they toe the provincial line. Municipal government being a child of the province. Moreover, the decision making process being what it is, there is very little urgency to get transit going. There will be lots more studies and “consultation” but very little actual expansion any time soon. A token bus lane or bike path here or there maybe, but no significant investment in track or rolling stock until the Gateway’s vacuum cleaner hose has been taken out of the money pile. If the Mayor’s seriously hold to their views on property tax, they actually do not lose very much. For the province continues to show that it lacks commitment to a significant expansion of transit and other nonSOV modes. And the Evergreen Line has been ready to go for years – and hasn’t. Mostly because the province would not budge on its “need” for a regional contribution. There is no real commitment to any consideration for the need for more operational funding either: it seems to me to be always about capital projects when there is barely enough to keep the system going, let alone be expanded. And, of course, there is also the ludicrous exercise of spending $100m on fare gates to save less than $7m a year in perceived lost revenue. The great benefit for the province in the Mayors taking that stance is a the excuse that due to such intransigence, nothing can be done at all and indeed Translink’s governance clearly needs to be re-examined. So, they are damned if they do and damned if they don’t. But at least they know that it will only last for a short while. We now know when the next provincial election will be, and there is the chance that a new government genuinely interested in reducing carbon emissions and improving long term sustainability will get elected. Then the discussion gets really interesting, since much of it will be about how quickly can all this new road space get converted into bus and bike lanes! Don Cayo, a financial columnist on the Vancouver Sun, is usually worth reading, I do not always agree with him but his analysis is always sensible and not always driven by an ideological agenda. I wish I could say the same about the C. D. Howe Institute. They are one of the chain of right wing think tanks spread across North America, paid for by the extremely wealthy and privileged to promote the neoconservative creed which has paid off so handsomely for them. They are the people who produced the report that inspired Cayo’s latest opinion piece. It is always quite hard for the people who drive single occupant vehicles to grasp the concept of the amount of public resources they consume. It is even harder for them to accept that those who put up with the inconveniences of car sharing or public transit (the car pool that leaves every 15 minutes) are helping by making better use of the road space available. And, of course the lane looks “empty” because if it was jammed with traffic too, it would not be working. The whole idea is to put some people at the front of the line and make the rest wait a bit longer. They have by now got used to the idea of queue jumping at airport gates – because they have had their ticket paid for by someone else who is willing to absorb the much higher front cabin fare as a cost of doing business and hence a write off against tax. Actually, if you think about it, that is the way that the rest of us taxpayers subsidize them. HOT (High Occupancy or Toll) has been around for a while, so there is some objective research. Initially, they were dismissed as “Lexus lanes” but it turns out that given the right sort of sort pricing policy, and a way of conveying variable price information to drivers in the traffic jam, drivers can actually make sensible decisions – and everyone has their own valuation of time. Obviously, there will be days and times when the chance of saving a few minutes will be worth several dollars. Some people, even with limited disposable incomes, are highly intolerant of any delay, and arrange their lives so that they do not have to cross a bridge at peak periods. Others have time to waste and no money to spend at all. They currently happily add themselves to existing traffic jams, not tuning their radios to AM730 but just accepting that at this time of day they will not be going anywhere fast and can listen to their favourite music. And be unavailable, now that texting and telephoning are not permitted. All right I added that out of mischief. It seems we still do not understand that this is a life threatening issue – not just the outside chance of a fine. I saw a presentation on the success of variable rate HOT lane pricing in Minneapolis some years ago so I was pleased that an early hit on my Google search was the DoT report “In Minneapolis, converting HOV to HOT lanes with dynamic pricing increased peak period throughput by 9 to 33 percent“. I think it is worth considering if we actually want to increase peak period throughput on freeways. Is that necessarily a Good Thing? Cayo, of course, points to the cost of congestion. But that figure is calculated system wide, not just on one link. And for a good reason. If you solve one bottle neck, all you do is move the queue somewhere else. This was the reason why the Lions’ Gate Bridge was not widened to accommodate another lane. All that would have done is take the line up from Taylor Way and put it on Georgia Street. Tolling Road pricing works somewhat differently – because it keeps the average generalized cost of transportation roughly the same. All that happens with variable peak pricing is that some trips get an advantage that others don’t, but system wide the volumes of traffic remain fairly constant. That is because there is a trade off between time and money. Road pricing is indeed more efficient ( in the economic sense of that word) – hence the Economist’s famous headline about how we now manage traffic using the same system that the soviets used for everything – queueing as a distribution mechanism (also favoured by the TSA). Which is a Good Thing if it overcomes the present knee jerk opposition to road pricing. What car users currently pay does not even cover the direct cost of highway provision. He is quoting from the CD Howe report here. We do need more money for the transportation system. But we also need to spend it more sensibly. Building the Golden Ears Bridge (GEB) just because it could be tolled, and therefore user fees would pay for it (they haven’t and probably couldn’t) made no sense to me when I reviewed it – but then it was never, formally, part of any transportation plan. I do not support road tolls to build more and better road capacity. That will simply generate (induce) more traffic. But we can use system wide road pricing to make decision making by trip makers closer to the real costs they impose on society. Which is a great deal more than the expression “roadway costs” was intended to cover by CDH. And the “surplus” can be “diverted” to funding a real transportation system that includes more and better choices than driving an SOV. This region needs system wide variable road pricing. The current political climate makes that a non-starter. But some experience with HOT lanes will start to change that. So I am all for the thin end of this wedge. It is not nearly enough, and if we do indeed manage to increase the throughput of traffic on roads already widened to accommodate HOV lanes then the impact on neighbourhoods adjacent to the exits is going to become very significant. The BC MoTH/BC Liberals did not pay attention to that when they decided to widen Highway #1, but that new induced traffic has to go somewhere: sure the ride down the freeway and over the bridge will be better – for a while. But the traffic when you get off the freeway is going to be much much worse. And some of those neighbourhoods are swing constituencies. The HOT lanes idea will have an even wider impact. Maybe then we can consider really effective changes to both transportation and land use. This morning’s Sun story has the headline “Coastal residents: BC Ferries should operate like marine highways“. They want all the residents of BC to subsidize the ferries just like the do the road system. This, of course, is not a new idea either – and was heard frequently with comparisons of the Albion Ferry (BC Highways – free) and the Millbay Ferry (BC Ferries – not free). Unfair it was said, and it was true, but no-one did anything. One BC Ferry – the one between Prince Rupert and Port Hardy – competes with cruse ships. Somehow I don’t think it is one anyone wants to be free – but I could be wrong about that. And, at weekends, the SeaBus is a great harbour cruise at 90 minutes for $2.75: you just have to get off and get back on again after each trip so they can make sure they have the right number of life jackets. Maybe they would get further with the fairness augment by saying that everyone should start paying the real cost of highways, which would also level the playing field.